Consequent to a series of tightening post-secondary budgets in British Columbia, Vancouver Island University librarians recognized the need for an evidence-based tool to support decision-making regarding cancellation of major package deals and resources. Librarians must be able to decide with confidence and to justify our decisions to renew or cut resources to ourselves and the wider institutional community. 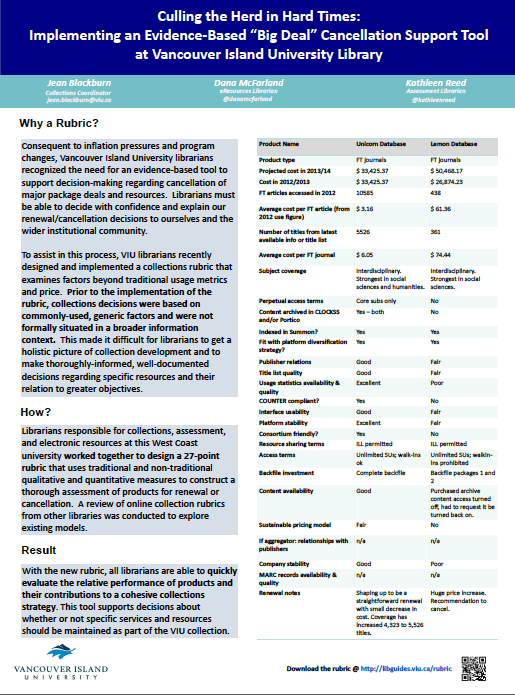 To assist in this process, VIU librarians recently designed and implemented a collections rubric that examines factors beyond traditional usage metrics and price. Previous to the implementation of the rubric, collections decisions were based on commonly-used, generic factors and were not formally situated in a broader information context. This made it difficult for librarians to get a holistic picture of collection development and to make thoroughly informed, well-documented decisions regarding specific resources and their relation to greater objectives.